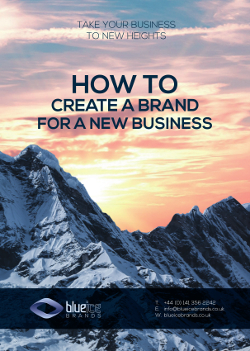 We have written a booklet aimed at helping people to create a effective brand for their new business. This booklet is available in both pdf and printed form – request your copy now! We wrote this booklet because we believe that the earlier you start creating your brand the better. Consequently, best time to create a brand is when you start your new business. This is because when starting a new business, you do not have any historical ‘baggage’ to deal with so you can start building a positive brand reputation from the day it is launched. In addition, the work that you do when planning the launch of your new business will probably make up a significant part of the work you need to do when laying the foundations for your brand. Finally when starting a new business, you are effectively forced to create the visual elements of the brand whether you intend to or not – you need to call you new business something, you need to give it some sort of visual identity, etc. Remember, creating a strong brand, or at least the building blocks of a strong brand, from the outset can save you a lot of heartache and issues in the future. Previous post What is a Logo Design Brief? Next post What is Brand Rejuvenation? Why Should you Audit Your Brand? What is a Brand’s Tone of Voice?